Home > Eco Touch Carpet + Upholstery 24 oz. Eco Touch Carpet + Upholstery 24 oz. Intense cleaning action that’s safe on your hands! Eco Touch Carpet + Upholstery is an intense carpet and upholstery cleaner derived from plant resources. It’s safe on your skin, your vehicle, and the environment. But the best news is that Eco Touch Carpet + Upholstery really works! Remove wine, coffee, and more from carpet, upholstery, and rugs. No kidding, plant-derived surfactants clean just as well as hard-to-pronounce chemicals and they won’t hurt your vehicle or your skin. Eco Touch Carpet + Upholstery is made with an organic solvent combined with citric acid and natural surfactants. These ingredients lift spots out of carpet and upholstery fibers to leave your vehicle’s interior looking fresh and clean. Since there are no toxic chemicals or solvents, there will be no lingering fumes in the passenger cabin. Eco Touch Carpet + Upholstery is non-toxic, biodegradable, and phosphate-free. (Phosphates are known to be harmful to aquatic life, so you won’t find them in any Eco Touch products.) The natural formula is also easy on your skin. 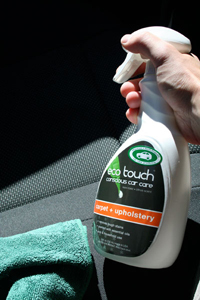 Some cleaners cause skin irritation, but Eco Touch Carpet + Upholstery is safe for you and your vehicle. Eco Touch Carpet + Upholstery is designed for carpet, rugs, and upholstery. Simply spray it on and allow the cleaner to penetrate for 1-2 minutes. Avoid over-saturating the material. Blot the area with a clean, absorbent towel. Tough spots may require light agitation with a soft-bristled brush. Eco Touch Carpet + Upholstery is a new way to look at cleaning! Potent bio-cleaners lift out food, dirt, and other common spots to leave your vehicle’s interior clean and comfortable. Vacuum your car’s interior frequently as most of the wear and tear of carpeting is caused by dirt. Treat stains immediately after they occur. The majority can be removed very easily if they are treated sooner rather than later. I've been using for the past 6 months and haven't found a stain this stuff can't get out. Has a pleasant fragrance and doesn't leave my car smelling like nasty solvents after using it.